NOTES ON JAZZ: Saxophonist Dayna Stephens: Knowing the Meaning of "Gratitude"
Saxophonist Dayna Stephens: Knowing the Meaning of "Gratitude"
Gratitude is a state of mind. A sense of seeing all the benefits that life has bestowed on one and demonstrating a true appreciation for having received them. Sometimes gratitude takes the form of a prayer of thanks to one’s creator. Sometimes it is a simple expression of showing those around you that you care and have not taken their kindness or love for granted. Sometimes it is a simple moment of acknowledgment that briefly crosses past one’s consciousness amongst all the daily clutter. 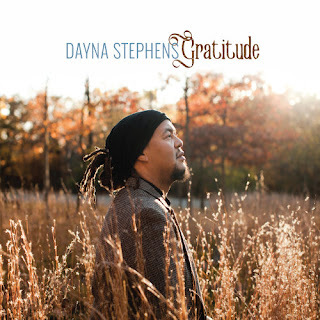 For saxophonist/composer Dayna Stephens Gratitude is a musical expression of joy, appreciation and a celebration of life. The thirty-nine-year-old Brooklyn born saxophonist grew up in the San Francisco Bay area before attending school at the prestigious Berklee College of Music in Boston on scholarship. He has studied with piano legend Kenny Baron, pianist Ed Kelley, trumpeter Terrence Blanchard and the iconic Wayne Shorter among others and was on his way to establishing himself as one of the top young voices of a new generation of saxophonists when he was diagnosed with Focal Segmental Glomerulosclerosis, a rare kidney disease, in 2009. After struggling with the limitations of the disease, awaiting a suitable transplant that somehow often seemed just out of, and with the challenge of finding the funds necessary to get the expensive anti-rejection drug treatment needed for the transplant, Stephens finally received a transplant from his Aunt Lauren Bullock in October of 2015. All during the process Stephens maintained his music as his own personal lifeline. Meanwhile the musical community, both friends and fans, rallied for him, planning benefit concerts, outreaching to the public for donations to help the young musician defray some of the costs of his operation and treatments.Stephens sees this new lease on life as a gift that he cannot take for granted and thus this heartfelt album Gratitude is his musical expression to all those that helped, encouraged and stood by him in his time of need. The music is a splendid offering by a deeply talented musician. His sound is warm and liquid, and conveys great emotional depth with an earnest but joyful intensity. The band features a stellar cast of today’s most sort after musicians; Brad Mehldau on piano, Julian Lage on guitar, Larry Grenadier on bass and Eric Harland on drums. Stephens’ musical selections are marvelously diverse and uber contemporary. He has skillfully distilled the music of such diverse artists as the French composer/violinist Olivier Manchon, the poetic stylings of Rebbeca Martin, the electronica-jazz driven music of Michelle Amador, the Americana tinged work of guitarist Julian Lage, the durable music of guitar legend Pat Metheny and the perennially masterwork of Billy Strayhorn, into a modern interpretation of what this music means to him. Starting with the beautifully rendered “Emilie,” we get a taste of Stephens deeply personal approach to sound. His tone is honey-throated, an authentic extension of his voice. Pianist Mehldau, exploratory as ever, responds to this sensitive piece with a probing solo that traverses the outskirts of the melody without ever losing its bearings. Grenadier and Harland offer turbulent, but somehow totally in sync backup, that redefines what it means to be provide rhythmic support. On the pianist Aaron Parks moving “In a Garden” Stephens sincerely states the melody and then bassist Grenadier takes an ambitious, plucky solo as Lage’s filigreed guitar work provides a delicate backdrop. On Michelle Amador’s “Amber is Falling” Stephens is again the lead voice. The band swirls around him in a mist of sounds in the intro, until the song takes on a more forceful launch with Stephens again leading the way with his fluid tenor that brims with clarity and purposeful direction. The superb rhythm section builds the song into a flurry of tension that allows Stephens to soar above the roil. Mehldau spins his pianistic magic on a solo of inspired imagination, spurred along in part by the limitless percussive wellspring of ideas that Harland’s drum kit provides. Stephens ends the piece holding a contemplative note to silence. On guitarist Julian Lage’s cinematic “Woodside Waltz” we are transported back to a time of wagon wheels and five-cent a beer saloon’s with a honk-tonk piano tucked off to the side of the bar. Mehldau employ the “tack” piano to produce the nostalgic sound. Stephens’ offers a plaintive sound on his tenor which is contrasted nicely by Lage’s nimble, Western-tinged guitar solo. On Pat Metheny’s ruminative composition “We Had a Sister,” Stephens uses his EWI/synthesizer to create an otherworldly sound. The electronics are nicely counterpointed against Mehldau’s, by comparison, stark acoustic piano sound. The composer originally played this song acoustically with his trio, but Metheny’s own subsequent electronic explorations could easily be the source of inspiration for Stephens version of this quiet gem. Stephens’ sole composition on this album is “Timbre of Gratitude.” The song features Stephens’ and Lage playing synchronous lines. On his solo, Lage traverses the fretboard with a gossamer touch that flows like droplets of water running down the silken strands of a spider’s web. Billy Strayhorn’s exotic “Isfahan” finds Stephens on the big baritone saxophone. His tone is rich with a lustrous vibrato that burrows its way into your chest cavity. The interplay between him and Lage’s masterful guitarwork is especially noteworthy. On Rebecca Martin’s beguiling “Don’t Mean a Thing at All,” Stephens’ tenor is warm and inviting and resonates into your soul. The marvelous melody is accentuated with a subtle synthesizer accompaniment by Stephens as Lage darts around the melody with his deft guitar accents. The closing song is a medley of two songs titled “Clouds.” The first by Massimo Biocati is a synthesized series of vamps with Stephens’ sole tenor voice singing against a trap drum background. The second is by Louis Cole and has a more magisterial, orchestral sound, again with Stephens tenor and synthesizer. Both offer an interesting look at mixing electronics with acoustic instruments to create intriguing aural landscapes. With Gratitude Stephens has returned from his brush with illness in renewed and inspired form. He has created a distinctive suite of music, with intriguing contemporary melodies, that should satisfy even the most demanding of listeners.